The content in this knowledge base is based upon the standard FACULTY180 environment. Your institution may have made changes to customize the FACULTY180 environment to meet your institution's needs; therefore, the screens in your FACULTY180 environment may differ slightly from the knowledge base. For more information, please contact your FACULTY180 administrator. Within FACULTY180, the Standard CV is the default vita template. 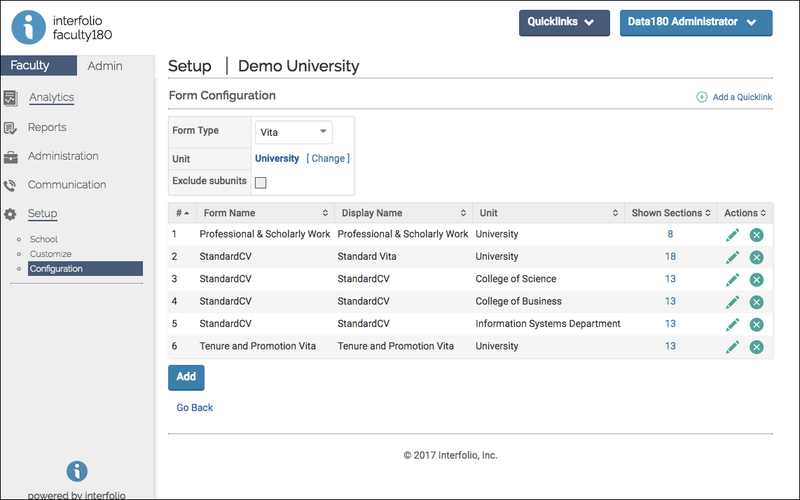 By default, a CV displays all sections that have been created by your institution, and the activities within each section. Additional vitae templates can be configured for multiple unit levels and can be built hierarchically, beginning with the highest institutional level and then for subunits (colleges, departments, etc.). Scholarly Contributions and Presentations citations in vitas can be configured to display Web of Science metrics, such as Times Cited. Web of Science metrics only display for scholarly works that are directly imported into FACULTY180 from Web of Science. If your institution has a campus license for Thomson Reuters products and would like to set up an integration with FACULTY180, please contact your Interfolio support representative. Once this functionality has been activated for your institution, the vita settings must be configured to display the Web of Science metrics. To do this, select the Show Web of Science Times Cited checkbox in the Section Settings section. Click Vita in the Configuration section. The Vita screen displays. Click Add. The Add Configuration dialog box opens. Specify the unit for which the new vita template is being created. Select the appropriate vita template. Click Add. The Add dialog box opens, prompting you to choose if you are modifying an existing vita or adding a new standard vita. Select the Add a new vita... option. Type a name for the new vita in the Vita Label field, then click Okay. The Configure Form screen displays. Click the Display drop-down arrow to specify if you want the vita to display in a traditional, tabular, or listing format. Specify if sections that do not contain any data should display on vitas using the Show Empty Sections option button. Specify if the vita name should display on vitas using the Hide Vita Name option button. Specify if activities excluded by faculty should be hidden using the Hide Activities Set "No" in "Publicly Displayed" option button. Activities are selected as hidden by setting the activity classification of 'Publicly Displayed' to 'No' for a specific activity. Enter a description of the vita in the Description box, if you choose. * Profile Form custom sections: if there is no start term or end term, fields are sorted in ascending or descending order by the first field listed. Use the Reorder drop-down arrows to specify the order in which the Content sections should display in the vita. You can also choose not to display specific sections in the vita. When you are finished creating the vita template, click Save. 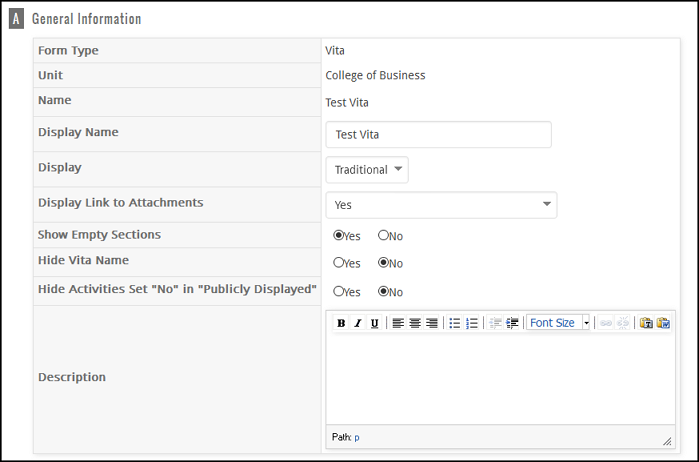 Your institution can create multiple vitae templates using the input sections established in the Profile Form and Activity Input Form. (See Customize Input Sections for more information.) Additional vitae templates can be created for specific uses such as annual reviews, promotions/tenure reviews, etc. ), and can be created for any academic unit established in your institution (college, department, discipline, etc.). Make sure Vita is selected in the Form Type list. Select the appropriate unit for the Vita form being changed. The Form Configuration screen displays. Click the Edit icon adjacent to the vita to be changed. The Configure Form screen displays. Click the Edit icon adjacent to the section you wish to change. The Edit Vita Section screen displays. Make the desired changes, then click Save.